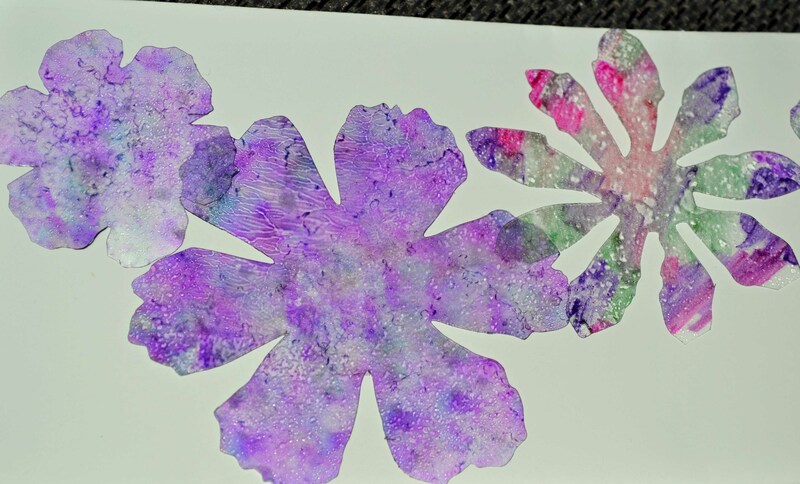 At the Craft & Hobby Association’s Mega Craft Show this year, I met Laurie Karian, who has her own line of gel printing plates at www.gelpress.com. I’m a relatively new convert to the joys of gel printing but now that I’ve gotten started, I can’t stop! 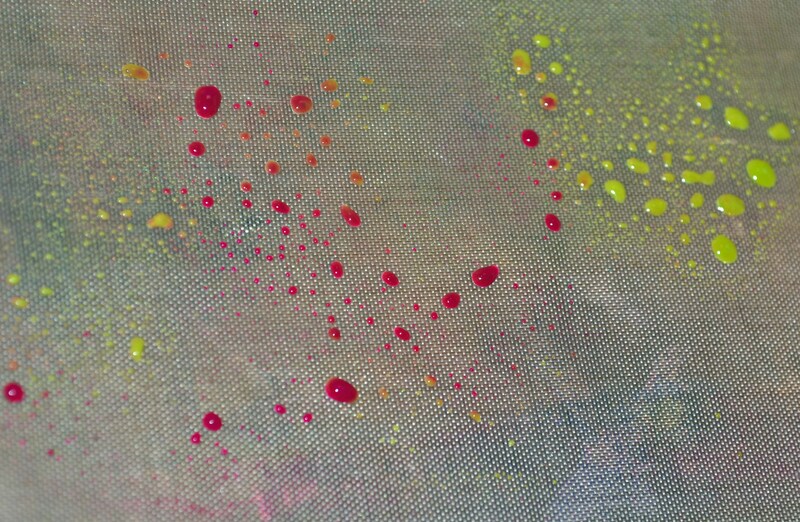 I played around with a variety of acrylic paints, including Americana® multi-surface Satin™ by DecoArt® and Dina Wakely heavy body acrylic paint from Ranger. 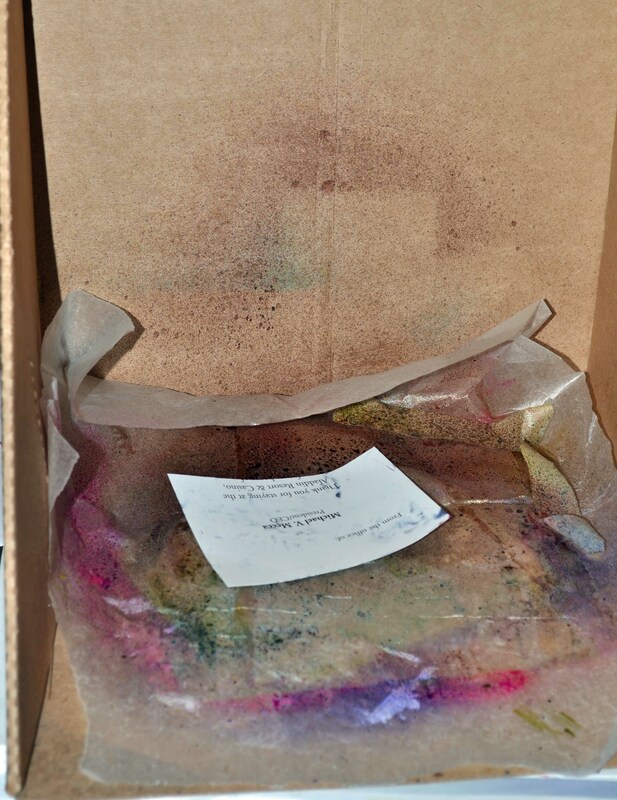 To create the patterns, I also used a variety of objects, including stamps, bubble wrap and corrugated cardboard. 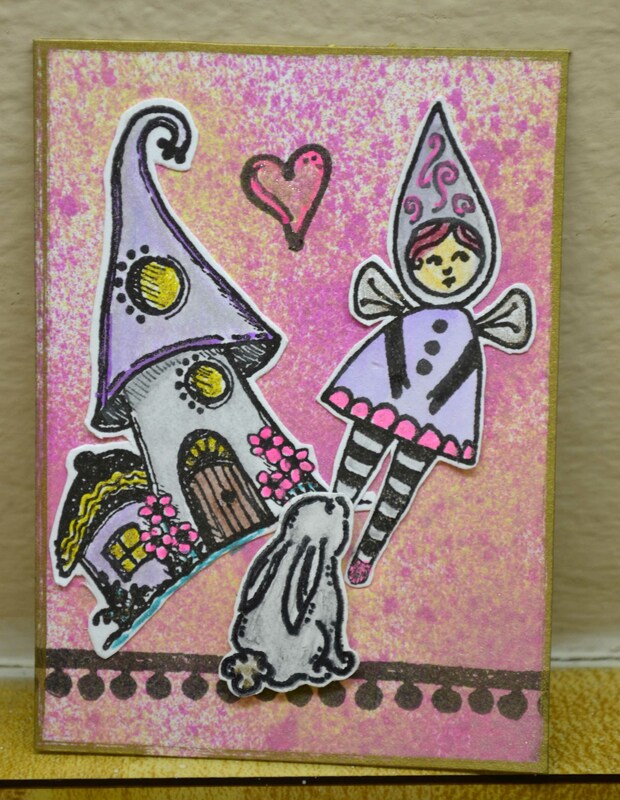 I really loved using Plaid’s Fabric Creations™ block printing stamps, which look like old-school wooden block print stamps from India, as well as some foam stamps from Art Foamies (which worked really well with the paints). 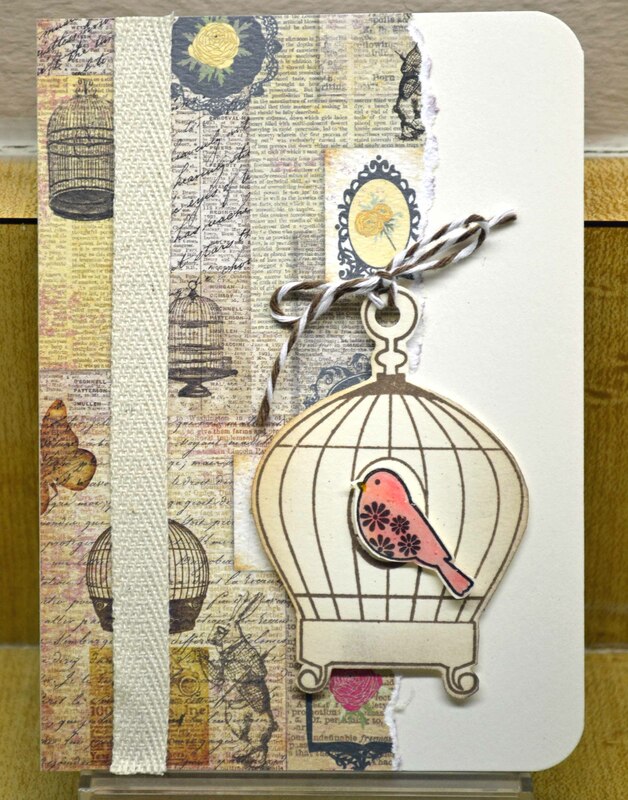 The bird and birdcage are from a Prickley Pear stamp/die set. 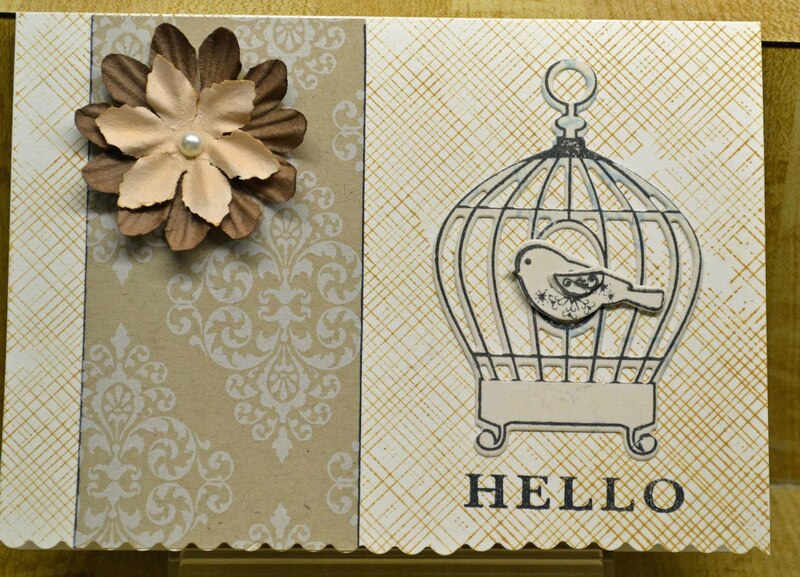 The birdcage was die cut twice, then stacked and gold embossed. The bird has a coat of clear Wink of Stella. 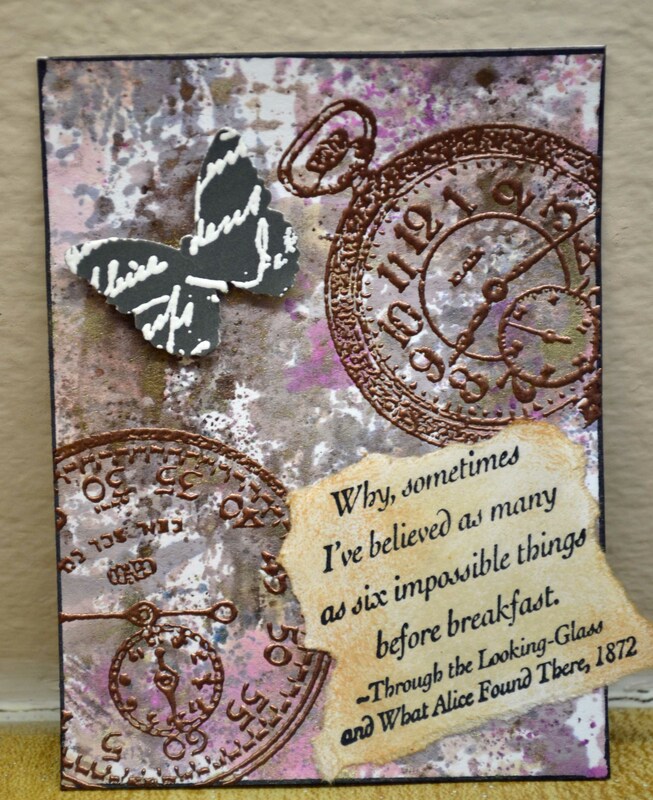 The sentiment, black embossed on vellum, is from Hero Arts’ Everyday Sentiments CL497 and attached with a Tim Holtz Tiny Attacher. 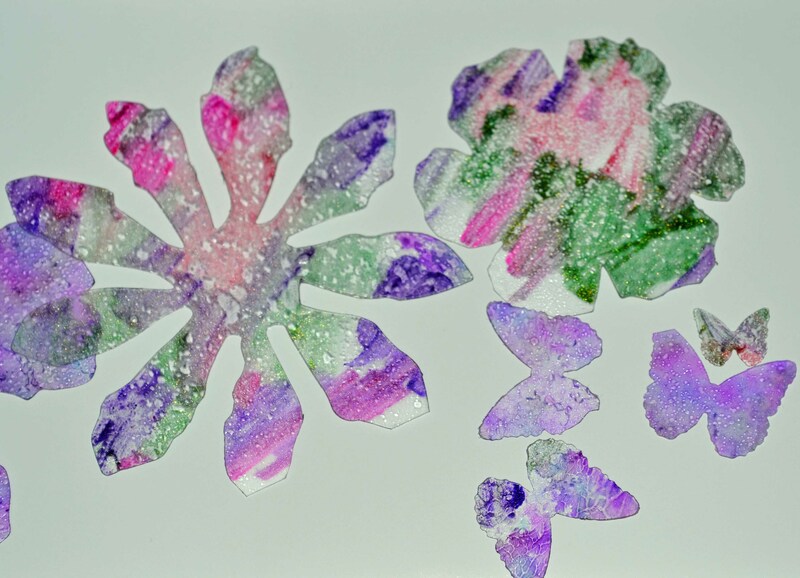 For this piece, the foam stamp was stamped into the wet paint, removing some of the paint; the green leaves were stamped after the print dried, using StazOn ink. The Dew Drops are from Robin’s Nest and were attached using Ranger’s Glossy Accents. 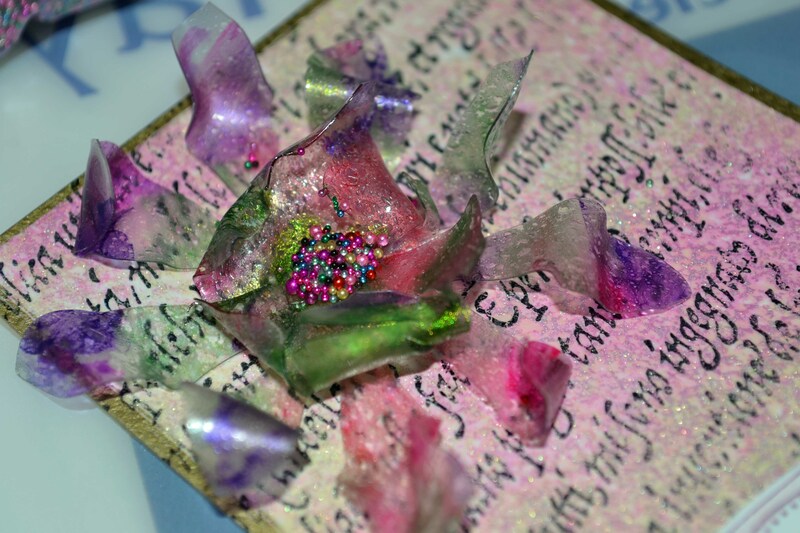 One note I have neglected to mention for a while … I have been using ScraPerfect’s Best Glue Ever for a lot of my gluing, especially of tiny pieces. I’m loving this adhesive! Stay tuned for more of my gel addiction! 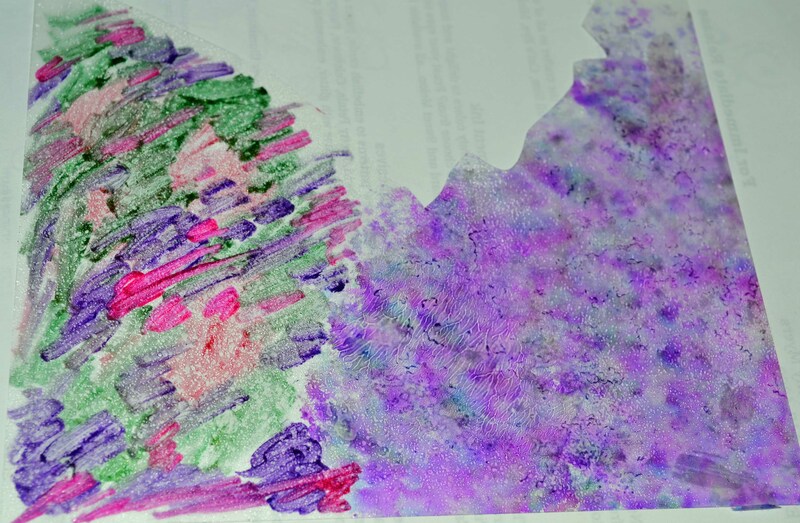 Buried among other bits and pieces was this cool background piece made by rubbing Gelatos (see this post and this post for more info on Gelatos) on water color paper. The big fish is from Rubber Stamp Plantation. 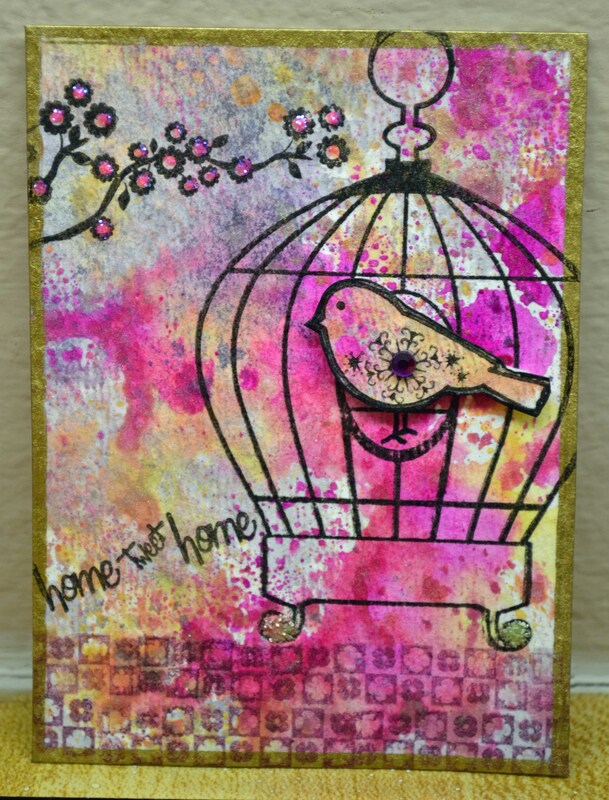 Here’s another card made using random pieces found on my desk. 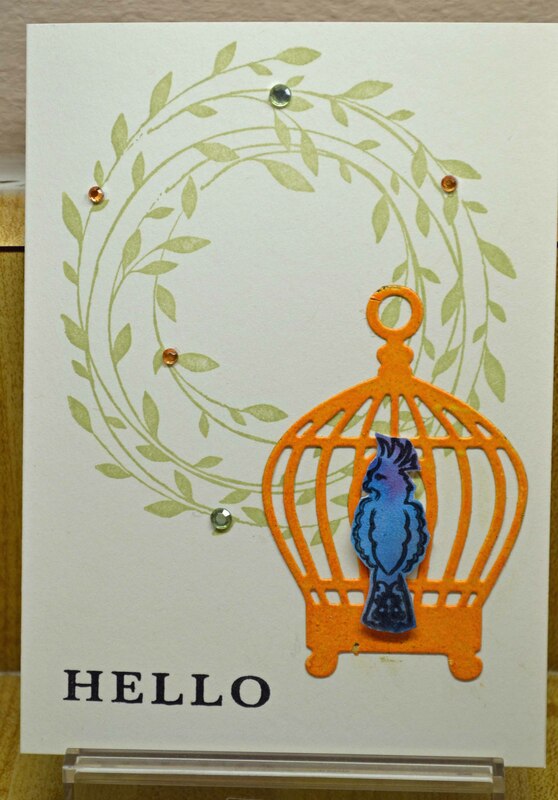 The birdcage (a stamp and die set) is from Prickley Pear; the quote is from Hero Arts; the die cut border is a Spellbinders die; the gold paper is, I think, Die Cuts With a View. There is so much more to clean! Stay tuned…. 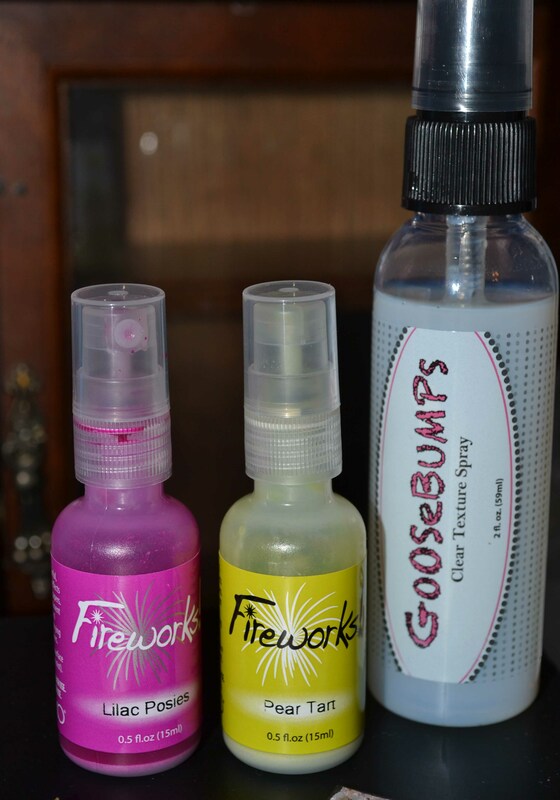 Fabulous Finds Friday — Tools and more! How many times have you cut yourself on a craft knife left exposed on your desk or in a drawer? Uh huh. Been there, cut that. 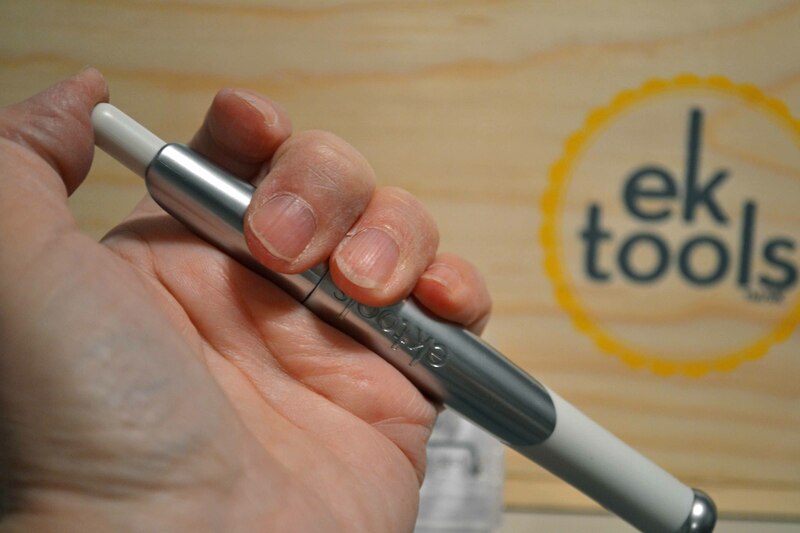 Enter the retractable knife from EK Success. First, I love that it clicks open and closed. But to make it even better, you don’t have to touch the blade to load or remove it. 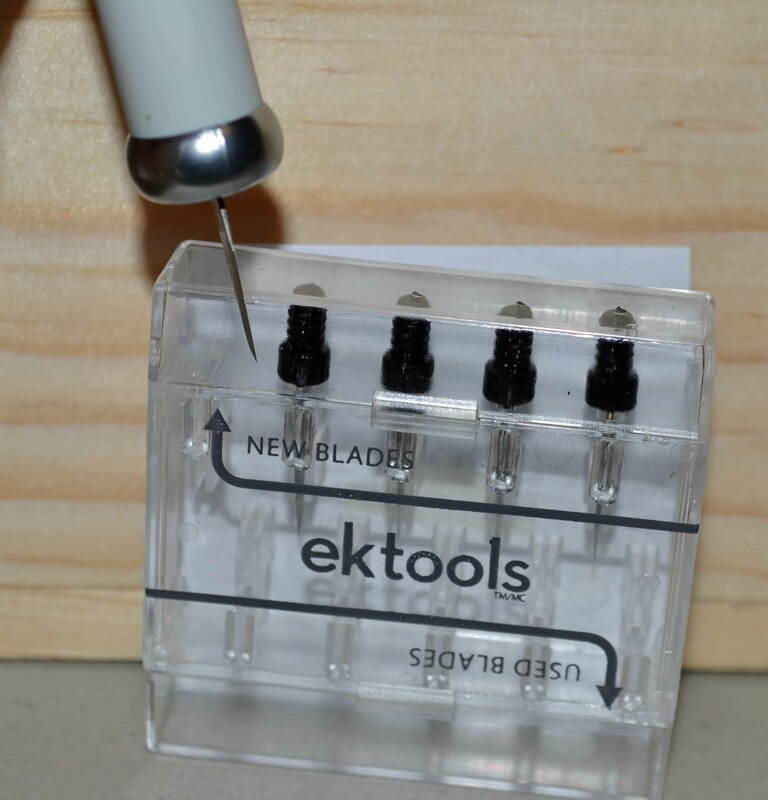 Just click the button on the top of the knife to expose the blade and stick it onto a new blade to load it from the nifty case; click again and point into the OTHER end of the case to unscrew the old blade safely. Genius. It makes it easy to see a straight line so you can easily line up images, or make sure your sentiment is straight. 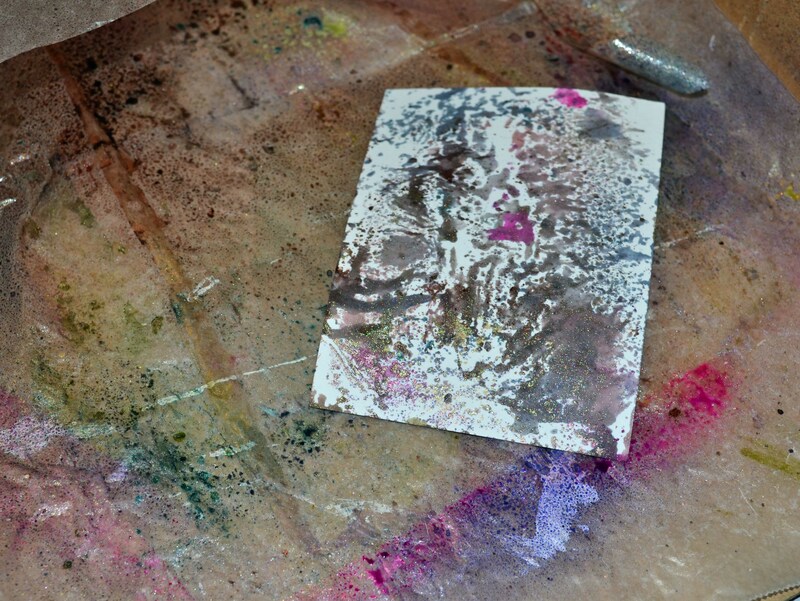 The light shines through an acryclic block for stamping purposes. 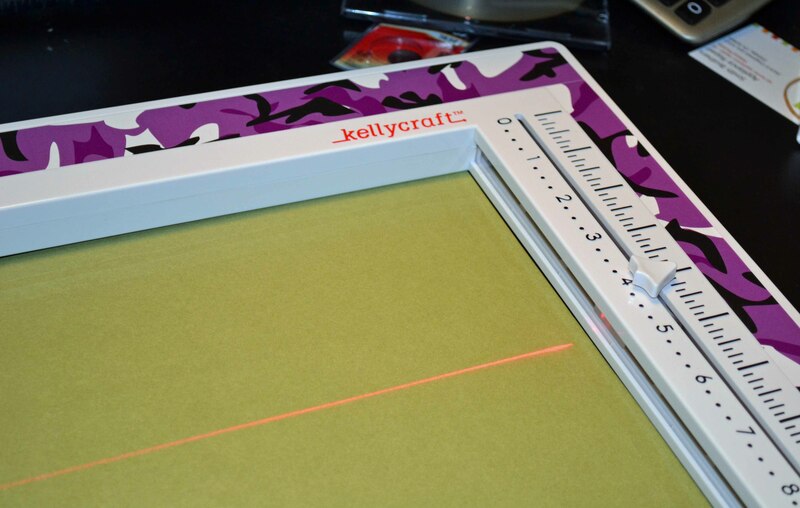 Put a cutting mat under it and you can line up a metal-edged ruler and cut away without drawing any lines. Anyway…. 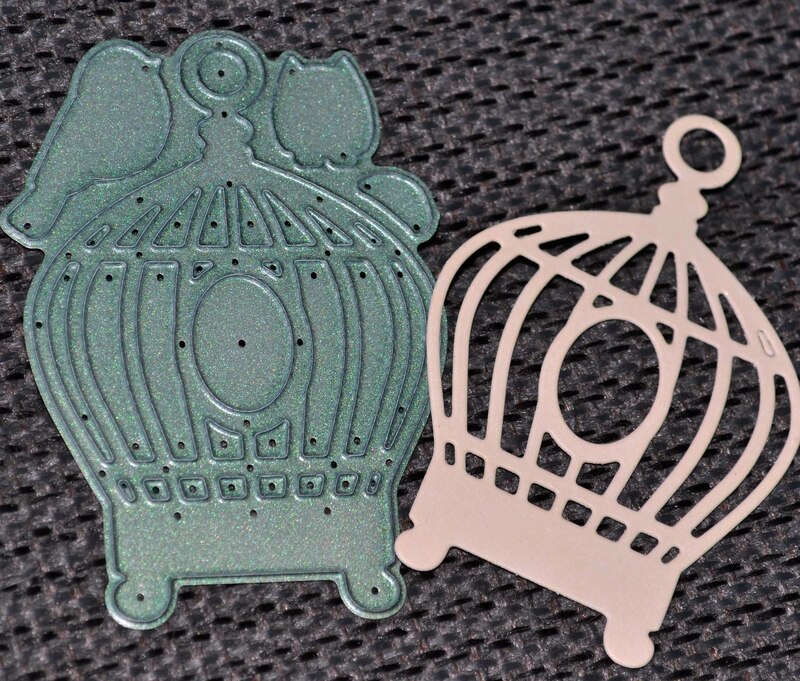 one thing I found in my research is that many stamp companies are making dies that coordinate with stamps (and vice versa.) 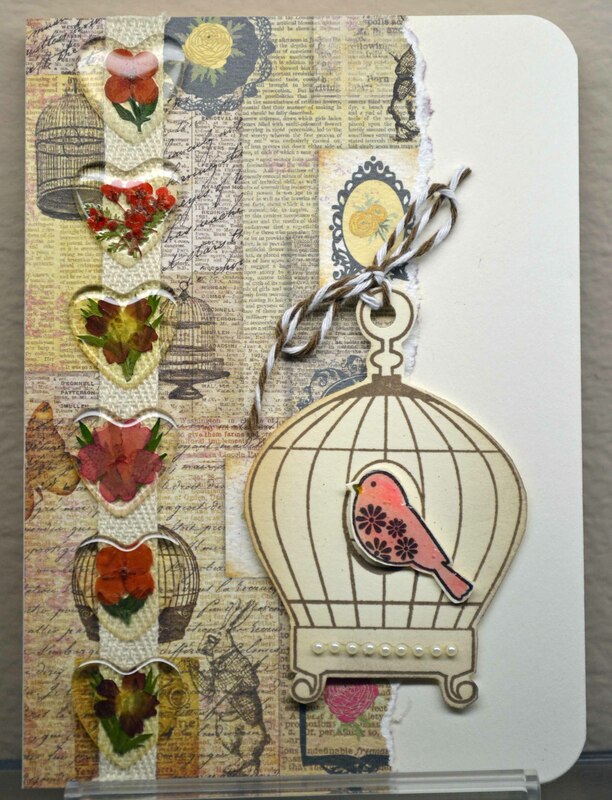 Companies include Heartfelt Creations (coordinating stamps/dies), Technique Tuesday (stamps made to match Spellbinders’ Nestabilities), Prickly Pear (dies/stamps), PaperTrey Ink (dies/stamps), Gina K Designs, Layers of Color, JustRite Stampers and others. Hero Arts and a few others contribute designs for the Silhouette. Check out this cutie from Prickley Pear. 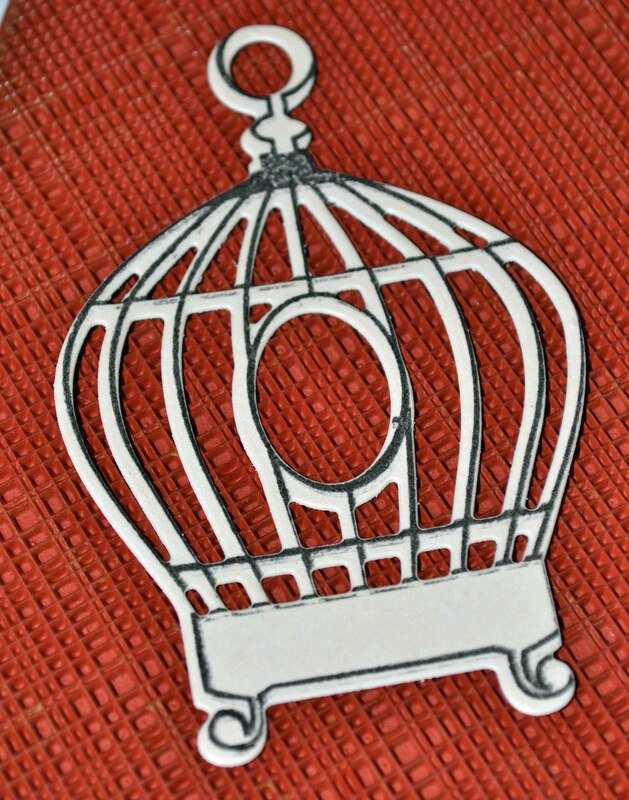 Can you imagine how tedious it would be to cut out this birdcage? Not to mention the little bird and owl hiding in the corners. 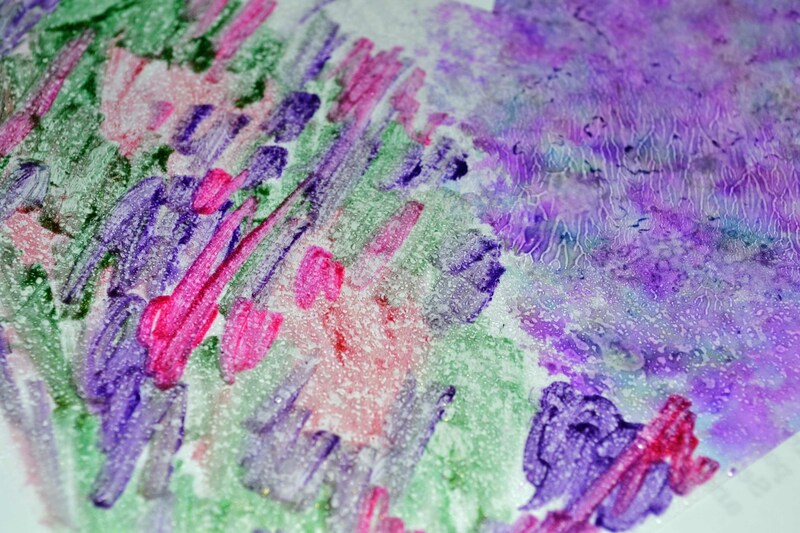 The only problem is, I am an imperfect stamper. I can’t seem to properly line up my stamp, even though it is clear. (Maybe my depth perception is off???) See how it’s wonky? Oh, I was so pleased with myself!!! (Grin.) I love Zing powder because it is smooth, opaque, and melts evenly — it gives great coverage, and the colors are yummy. But I shouldn’t get too cocky. I fared a little better (just a little — I need more practice!) 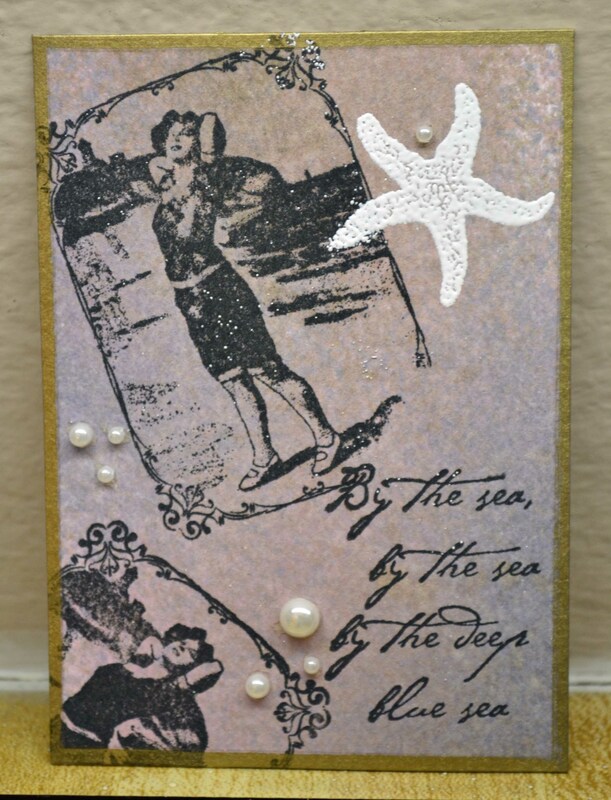 with my stamping on the next cut out, but messed up the card itself. 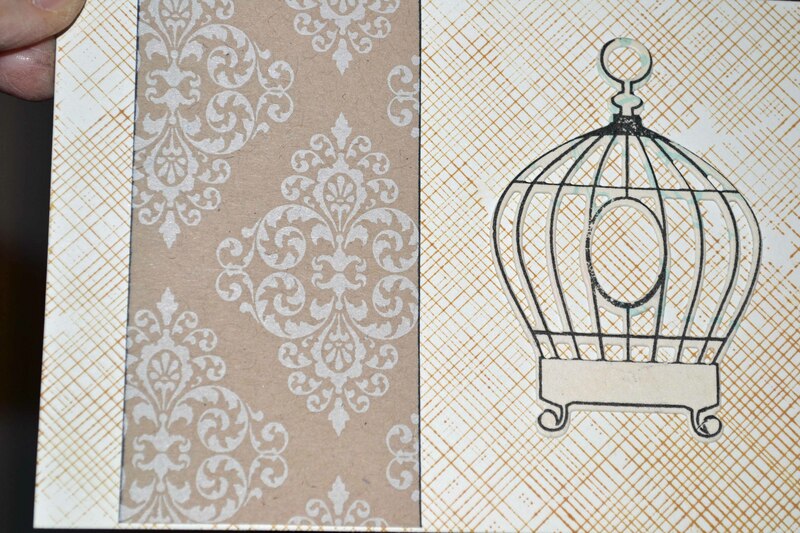 Can you see that the bottom of the damask print decorative paper is too short? Sigh. 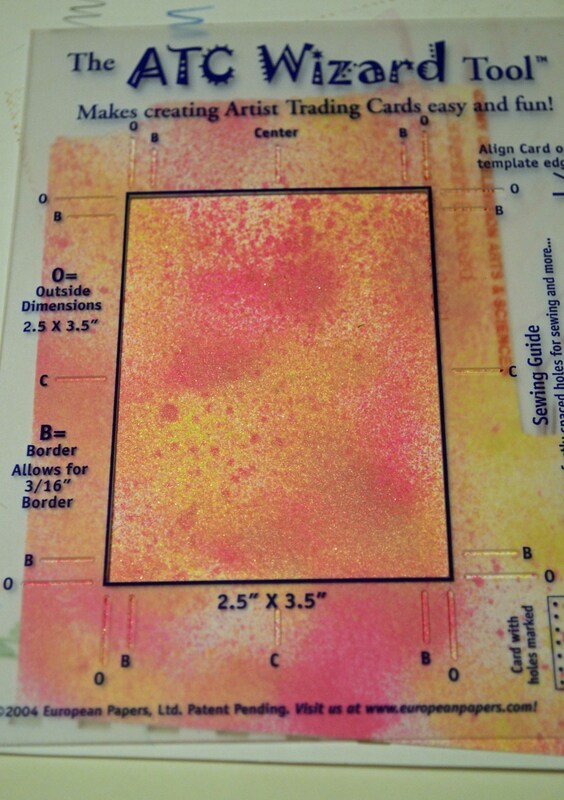 And there you have it — the Imperfect Stamper strikes again! 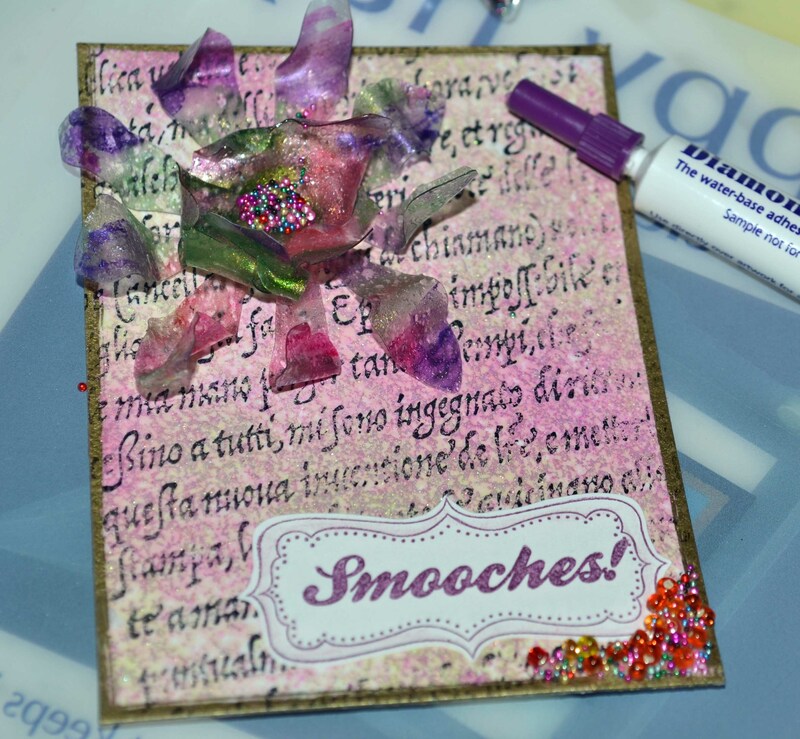 Thanks for joining me on my die cutting adventure, warts and all. 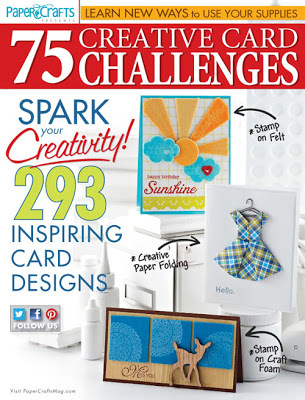 And if you have any tips for getting your stamps to align with a die cut, send ’em in! Happy Independence Day to my U.S. buddies. I repeated this process a few more times, using cornflower blue and then walnut antique spray (also from Tsukineko.) The darker colors took over, but I liked the aged look. The flower looked too flat to me (and it was too big for the ATC), so I CAREFULLY and gently warmed it with my heat tool (holding the flower with a tweezer) just until the plastic softened and started to curl. Whew! Thanks for sticking around so long!